In his tagline or subtitle for his insightful history of grading post, Joe Bower notes that "assessment is not a spreadsheet--it's a conversation." We all know that grades are an inauthentic and subjective measure of student knowledge and/or ability. I can't imagine most of today's teachers trying to have conversations with 120 or more kids, especially at the level necessary to reflect pre-Farish teaching. If you haven't read Bower's post yet, let me sum up: before Farish and the Industrial Revolution, teaching was incredibly different as there were fewer students, "grading" was on a pass/fail, students were assessed as much by the quality of their mentors and teachers as their grades. Then Farish found a way to provide grades which saved him time and meant he didn't have to have those pesky conversations with students to learn more about them. You really should read the post, though. What's interesting in these shifting times is how we're again thinking about assessment as well as the relationship between student and teacher. For about two decades now we've been talking about differentiation. For at least a decade we've been talking about personalization. We've long talked about assessment and what formative assessment should and could look like and sound like in the classroom, and yet we've been seemingly reluctant to make changes. I suspect it has to do with grades. 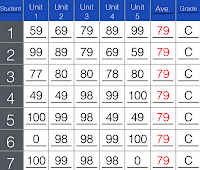 Even though research (and experience) tells us about the destructive and often counterproductive nature of grades, we continue to have grading systems. 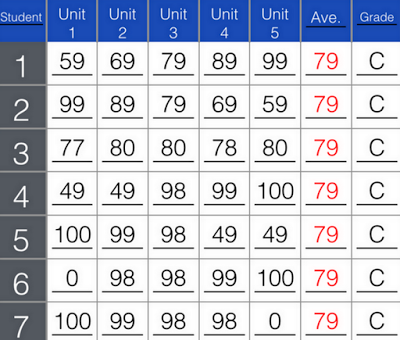 We have entire student and teaching support systems based on grades, literally. 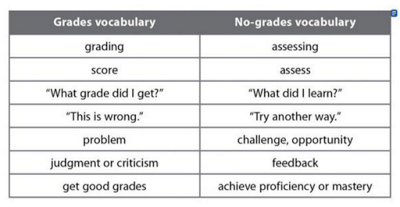 Teachers have a love/hate relationship with grades because most know that grades don't really tell the student anything useful and yet, providing the kind of feedback that could really help the student takes a lot of time. And with class sizes being what they are and curriculum expectations being what they are, well, it's just hard to find or make the time to provide that kind of feedback. At least given the way teachers are expected to teach and, if I may, given parents' expectations. I know of schools that have opted to go to a pass/fail system or to a scale of 1-4 with 4 being "mastery" and 1 being something like "needs help." The students haven't resisted but the parents have because we've all been conditioned to think that having a something-point GPA is what matters. Even if employers have been telling us for quite some time now that the GPA rarely matters because kids still don't know what they need to know or have fundamental critical thinking or problem-solving skills. What we have taught some kids is how to get good grades, but we have not necessarily taught them how to learn. So how do we do this? How do we manage to teach, to facilitate learning rather than cover material? How do we manage to provide useful feedback that encourages learning and promotes perseverance? How do we manage to have the kinds of conversations necessary to get to know our kids well enough to help make decisions about learning options AND to help them make decisions about learning opportunities? Great questions for which there are some answers, but for which there is no secret sauce, no silver bullet, no easy peasy solution. 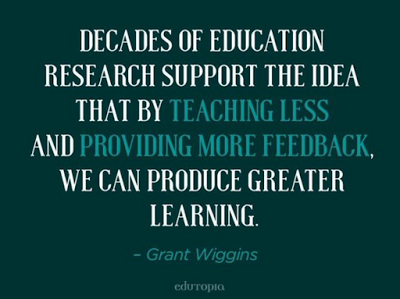 There is a lot of research out there on assessment and feedback, much of which I've been reading and thinking about the past few weeks. So please hold tight another day or two as I put together some additional posts. I'll also put together an annotated bibliography of some of that research for those of you who need and want to explore (further) on your own. In the mean time, spend a bit of time looking at a current lesson or unit plan and concentrate on how you plan to assess. Will you give a quiz? If so, how does that quiz help students make connections between what they needed to learn and the opportunities they were given to learn? How did that or those assessments enable students to measure their progress from where they were to where they needed to be based on the learning targets and stated expectations? I think just starting with those questions and breaking them down a bit will provide a great starting point. P.S. You might also read my post from the other day: Feedback and the Fourth Dimension.